Attention all music lovers! Here’s one sugar cube you won’t mind giving the kids. The Sugr Cube portable wooden wifi speaker is pure audio goodness and might just be the ideal music player for sending soothing tunes to little ears at nap time. Small and sleek, it’ll fit smoothly into any nursery decor and deliver great audio quality. Once set up and connected to your wifi network it’s easy to control via the Sugr Cube app for iOS or Android. Within the app you can stream music from Spotify, tune into a selection of internet radio stations or connect with any app that supports AirPlay. This means you can play music from your own iTunes library or stream from apps like Soundcloud. You can also use the Spotify and Apple Music apps independently with the Cube if you prefer. 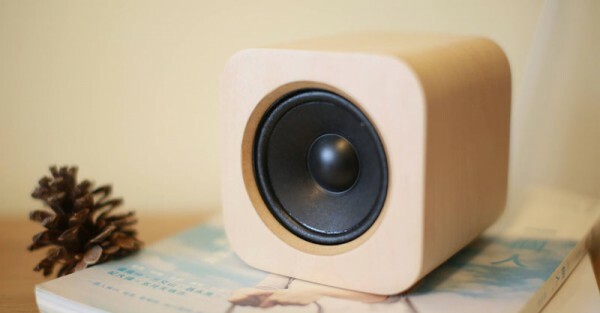 Apart from its gorgeous minimalist looks, what makes this speaker so great for the kids’ room? Well, a couple of things. Firstly – gesture controls. Turn it around and you’ll find no buttons except the on/off/volume dial at the back and micro USB port for charging. Instead just tap the top of the speaker to play or pause, tilt the speaker left to skip to previous track or right to skip to next track. This means no buttons for little fingers to meddle with. Or if you’re happy for an older child to get their hands on it, the controls are intuitive enough for them to use on their own without the danger of messing up settings. Secondly the Sugr Cube connects via wifi, not Bluetooth, so it doesn’t need to be in close proximity to a streaming device (probably your phone). You can stream music to the speaker in the kids’ room without having to put your phone in there too. Should you want to move the speaker whilst listening to music you can easily carry it from room to room within a wifi network without disconnecting your sounds. Plus, you won’t hear those annoying amplified notification noises when you get a new email like you do with Bluetooth. But what about taking your portable speaker beyond your wifi network – away from your house? Well the canny folks at Sugr Cube have thought of that too. Each Sugr Cube has four gigabytes of internal storage for just this purpose. Just use the Sugr Cube app to remotely transfer music to be stored on the Cube and play tunes to your heart’s content. Or at least as long as the battery lasts, which is up to 24 hours, depending on how loud you like your tunes. This video is a great run through of all the basic features. If there is a downside it’s that being only one speaker it plays tunes in mono, but if that bothers you, you have the option of pairing two for a quality stereo sound. And in case it ends up sneaking onto your bedside table, it also has an alarm clock feature to make it the ultimate musical bedside companion. Sugr Cube’s great looks and effortless control system make this a sweet and simple music solution. 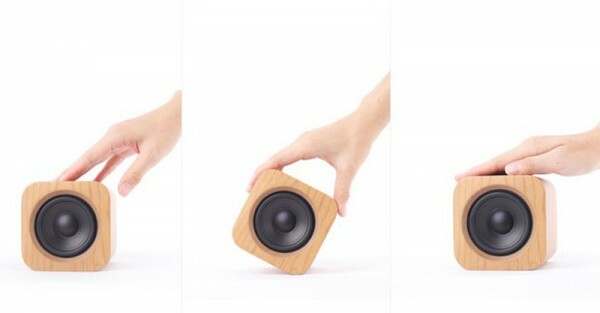 Available in Maple and Cherry for US$229, plus shipping from Sugr Cube.